In the 1830's and 1840's, Cincinnatians were devastated by a cholera epidemic. Funerals became a daily occurrence and some of Cincinnati's civic leaders expressed concern over the lack of proper cemeteries where families could visit to honor those that had died. At that time, cemeteries were often just in the back of small churches that dotted the community. It was decided something better could be done to help the grieving families. As a result of these concerns, members of the Cincinnati Horticultural Society formed an association in 1844 to address these issues. Their first task was to find a place where a park-like setting could be created that would not be disturbed as the Cincinnati grew. They also wanted it to not just be a cemetery for the dead, but a park for the living featuring flowers, trees, walkways and shrubs with paths that that traversed the cemetery. Some members of the group traveled throughout the United States and Europe visiting cemeteries of outstanding reputation and beauty. From these travels they planned a cemetery that would equal or even surpasses the beauty of these cemeteries. From these plans arose the Spring Grove Cemetery. The founders publicly proclaimed their hope that the natural setting of Spring Grove would be a contemplative atmosphere conducive to consolation, commemoration, and education. The first burial was made September 1, 1845. The concept of the park-like cemetery developed at Spring Grove Cemetery is used throughout the country, although at the time, it was considered a radical concept in cemetery design. 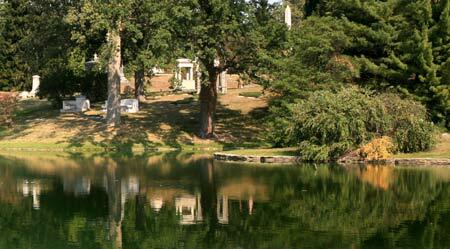 In 1987, Spring Grove Cemetery officially changed its name to Spring Grove Cemetery & Arboretum. The idea was to include the expansive collection of both native and exotic plant materials as well as its State and National Champion Trees and its Centenarian Collection. Today, Spring Grove Cemetery and Arboretum includes over 700 acres of which 400 acres are beautifully landscaped and maintained. The 300 or so undeveloped acres guarantee the cemetery will be able to fulfill the needs of Cincinnati for 100s of years in the future. 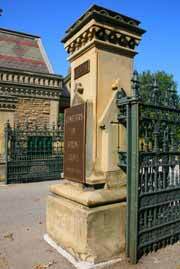 The Spring Grove Cemetery & Arboretum is visited and studied by thousands of visitors each year and it is included as one of the outstanding features of Cincinnati by the Cincinnati Chamber of Commerce. You may not think of having a wedding ceremony at a cemetery, but the Spring Grove Cemetery does just that. The grounds offer a variety of unique locations for wedding ceremonies including the Garden Courtyard, Lakeside Chapel, and the Norman Chapel.